I wasn't a chef when the Old Fulton Fish Market was still in operation at South Street Seaport before it moved into the warehouse wilderness of The Bronx. In fact, I had only lived in New York for a little over a year before it closed. Still, I never had a chance or much of a reason to visit the Fulton Fish Market in all its stink and glory. Why would I have cared about the market or the history of the area? I doubt I even knew what the hell a fish market was. Fast forward eight years. A few weeks ago I stood in the temporary office of the New Amsterdam Market team down at the South St. Seaport. It bleeds history. The building is primarily used as artifact storage. But recently its drafty rooms have also sheltered the tireless and freezing staff of New Amsterdam Market, while their water-damaged Sandy-stricken office at 224 Front Street is repaired and renovated. I was there to meet with Robert La Valva, the founder and visionary leader of the organization to discuss the market - revisiting the successes and failures of the past season and brainstorming about the future. I arrived early to find the previous meeting still in progress. Robert introduced me to Erik Andrus and asked if I would mind if they finished up. I hung back, examining the room. Robert's makeshift office is dark and a bit brisk. The tobacco-brown floors and walls nearly vacuum the sun from the room. The table he uses as a desk is just by the interior windows overlooking historic slate rooftops. The mid-morning late-winter daylight cut in from the east, dropping sharp lines through the windows and casting rich, deep darkness wherever it failed to reach. The light lingered on Robert's desk where a scale model of a brick-like masted wooden ship seemed to float, waves rippling and sails fluttering. Erik explained the 1/12th scale model and his vision to return sail freight back to the Champlain-Hudson Valley waterways. He pitched it as a "A Carbon-Neutral Transport Company Connecting the Farms and Forests of Vermont with the Lower Hudson Valley". The sails, mast and riggings are designed to lower when passing under the dozens of bridges the barge will have to venture past. At port the main mast can also serve as a crane to offload packages. Robert and I were mesmerized by the ingenuity, history, research, engineering, planning, and foresight pouring out from Erik. This wasn't an infant idea. In fact, Erik was well on the way to begin construction on a ship but had been advised to talk to Robert to see how his vision could fit into plans for the Seaport. We looked through illustrations Robert had earlier pulled from the archives, one of which came from a late 19th century issue of Harper's Bazaar. It showed the Pier 17 area covered with floating cages that looked like pallets. They sat close enough together to allow passengers and shipmen to trek over the water and unload a barge much like the model that lay before us. Fishmongers stored live fish beneath those pallet-like wood surfaces so they would be fresh and ready for delivery to that or the next day's market. Erik's "crazy idea" is really about reinvigorating the New York City waterways with a kind of water bound traffic that no longer exists. He was able to explain a cogent, rational and potentially transformative method for transporting several thousand tons of goods from the Champlain Valley to lower Manhattan without any use of non-renewable energy. Such traffic could bring foodstuffs and similar freight into the port area much as it had in the city's earliest days. I was stunned at the simplicity of the idea and shocked at my own naiveté and acceptance of the huge diesel ships and trucks that are the mainstay for importing goods into the city today. But the more I listened, the more little things began to line up. Erik's vision has the potential to bring innovative new middle-class jobs to the seaport, revitalizing the area and moving it beyond the shell of a tourist hub that it has become. We have a big dream and an outsized vision too. Our vision and project began with a taco. To make a great taco you need to have access to great ingredients, ingenious suppliers and a tight network of other companion small business owners to collaborate with, learn and grow. New Amsterdam Market created a space in the city for folks like us to succeed and grow our vision and is re-energizing the Seaport. New Amsterdam Market has become a mainstay of many residents' lives over the past seven years, and it's shown that a diversity of ideas is appealing and magnetic. New Amsterdam Market brings together business owners like Erik and ourselves, and together we can forge new ideas and create a space for incubating the dreams of the future. In 2005, after the Fulton Fish Market finally left the Seaport, corporate developers put forth a vision to reframe and rebuild the area into a vast combined retail and residential project. Simultaneously, independent businesses and new residents saw an opportunity around the Seaport and took advantage of the unique historical spaces and affordable rents. 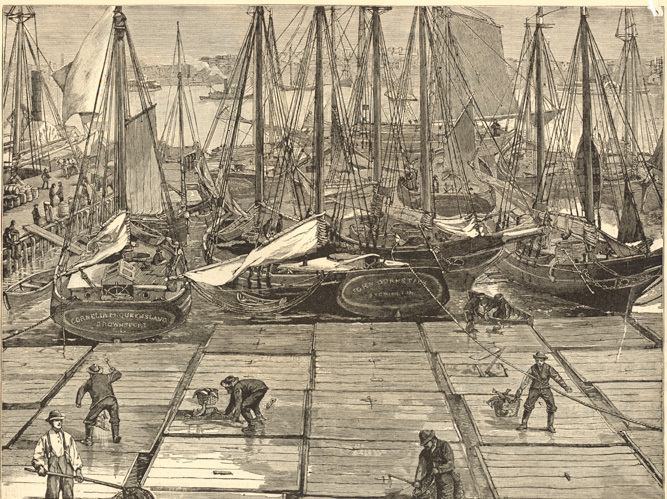 With the addition of New Amsterdam Market, the Seaport blossomed into a vibrant, diverse and lively community. In contrast, Pier 17 remained a tourist destination despite a dwindling number of visitors. But all that changed when Superstorm Sandy's great waves came and pushed nearly everyone away. Venture down to the South Street Seaport today and you'll find that the only lively places left are run by small business folk that are struggling to keep open. Unlike the little guys, many of the big developers and corporations chose not to face the challenges and costly expense of re-opening their doors. Instead, they turned their backs on the neighborhood and dug in for more city and state financed kickbacks - more time to pursue the larger and yet hollow goal of a glass filled castle of retail shops in the sky. But small business owners can't afford to write off the damages and expenses of renovation. They aren't willing to close up shop and lay off employees. Instead, they poured more of their lives, savings, and hopes and dreams into the area. They rebuilt their ruined spaces as quickly as possible in hopes of renewed commerce and foot traffic at the Seaport. I believe that a lively, vibrant and permanent commercial seaport could empower the city again. Why let the shells of the New Market and Tin Buildings sit empty when the South Street Seaport has a unique position in New York's history? It already possesses the characteristics that can lead to this renewal. A permanent New Amsterdam Market can provide a jolt of that energy into a desperately needed place. A place a few steps from the docks where fishmongers, farmers, merchants, chefs and shippers intermingled and cast out shouts of the day's comings and goings. A place where serendipity enables them to talk to the Eriks and Roberts and future Lonestar Tacos of the city. And a place where we can create history rather than just observe it. That place is near at hand: the fate of these city owned properties is now in the hands of our government. Will the Tin Building and New Market Buildings be rendered asunder and rebuilt as tributes to corporate wealth? Or can they be re-imagined into New Amsterdam Market, a vision that will weave the Seaport back into the vital fabric of New York? A place where entrepreneurs get their start, where chefs run across the Brooklyn bridge to meet their favorite purveyor of vanilla or olives or local fish. A place where a 21st century farmer and shipbuilder can deliver his first load of Japonica style rice raised in the Champlain Valley of Vermont. A place that celebrates and utilizes the currents of wind and water that made this city the center of the world. New Amsterdam Market can re-energize the downtown area from the wanton wreck that Sandy left and be rebuilt, reinforced and reimagined to withstand the rising tides of the future. Return the New Market and Tin Buildings into the hands of visionary leaders and the supporters of the New Amsterdam Market and grow the future of tomorrow today.